195 kW ETA Hack wood chip biomass boiler. installed in Gloucestershire with district heating system. After nine months of generating electricity, we're extremely pleased to say the system is producing 38% more than a standard fixed installation. Williams Renewables were very attentive at all stages and completed the job on time and on budget. I would have no hesitation recommending them. Williams Renewables were very efficient. They installed the system in 3 days with a minimum of disruption and to a high standard. The paper work throughout was good (the best experienced), clear and comprehensive and I had a comprehensive understanding of the options available. LED lighting will provide an immediate reduction in your electricity bill and a rapid return on your capital investment. Pellet boilers installations from Williams Renewables is able to offer the complete design, supply and installation of a wide range from ETA, Red365, Windhager and Hargasner. The size of boilers on offer range from 5kW to 200kW, covering installations from Passive Houses to light commercial buildings. Domestic pellet stoves can run your central heating and hot water system and provide a means of having the warm glow of a fire in your home, with automated starting and manual fill every 1 to 3 days, depending on the boiler size and heating demand. Domestic pellet boilers can be either manually fed or fully automated and range in size from 7kW to 45kW for very large houses. They need to be installed in a garage or utility area away from living areas. District heating systems are often thought of as huge systems, but we offer smaller sized schemes for rural flats and or small groups of cottages up to 200kW. Commercial heating for schools, leisure centres and businesses with systems designed, supplied and installed up to 200kW. 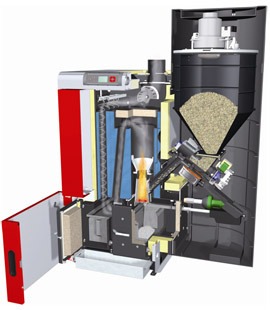 Wood pellet boilers can provide a fully automated system, allowing the user to have the fuel delivery at much less frequent intervals, with a correctly sized fuel store. Pellets can be ‘blown’ from the delivery vehicle directly into a fuel hopper at a distance up to about 10 meters, which eliminates the need for the fuel to be transported directly to the fuel store. Pellets are readily available in 15kg bags, usually delivered in 1 tonne loads. This will roughly be sufficient fuel for a 7 day period with a 20kW boiler. If space allows, hoppers can be built near to the boiler room, or sunk into the ground, allowing for increased ease of fuel delivery. Careful consideration should be taken to the site characteristics during the design stage as this can have a big impact on the on-going running and maintenance of the boiler system. The storage of pellets is very important as they must be kept in a dry environment to ensure their water content is kept very low, below 10%. Pellet boilers make very good replacement for oil boilers, not only because of the financial advantages, but also as the fuel store can often be installed where the oil tank is located and users are used to planning delivery of fuels. The savings without the RHI is up to 40% and with the RHI the extra cost of the boiler is very quickly recovered. London, Surrey, East Sussex, West Sussex, Kent, Hampshire, Essex Berkshire, Oxfordshire, Hertfordshire, Warwickshire, Gloucestershire Wiltshire, West Midlands, Somerset, Dorset, Worcestershire Herefordshire.